You must make reservations at least 5 minutes in advance of the time at Sufi's Atlanta. Sufi's Atlanta has established itself as the city's premier Persian restaurant. Sufi's is a fine-dining establishment serving authentic Persian cuisine in the Brookwood neighborhood, conveniently located between Buckhead and Midtown on Peachtree Street. At Sufi's, you will experience a wide array of Persian dishes, which you can enjoy in our elegant dining room or on our spacious patio, ideal for alfresco dining. Whether it's a quick lunch, a relaxing afternoon meal, a romantic date, or a family dinner, the staff of Sufi's Atlanta is dedicated to making your visit unique and memorable. Yogurt mixed with diced cucumbers and herbs. Yogurt mixed with chopped shallots. Yogurt mixed with cooked spinach. Combination of garbanzo beans mixed with tahini, garlic, fresh lemon juice and olive oil. Grape leaves stuffed with rice, ground beef, chives, tarragon, parsley, cilantro and raisins. Patties made of ground chick peas, fresh herbs and spices; deep fried and served with tahini sauce. Spicy sauteed eggplant, onion, garlic, chick peas and spicy tomato sauce. Sautéed eggplant mixed with kashk (yogurt whey) with mint and caramelized onions. Smoked roasted eggplant with cooked tomatoes and garlic. Choice of any 3 of the above tasty appetizers. Skewered marinated chicken breast, cooked over an open flame and served on a bed of lettuce, tomatoes, onions, cucumbers and mixed with our house walnut vinaigrette dressing. Fresh salmon cooked over an open flame and served on a bed of lettuce, tomatoes, onions and cucumbers mixed with our house walnut vinaigrette dressing. Skewer of seasoned ground beef cooked over an open flame and served with saffron basmati rice. Skewer of seasoned ground chicken cooked over an open flame and served with saffron basmati rice. Chunks of marinated sirloin, cooked over an open flame and wrapped in freshly baked bread with a mixture of diced tomatoes, pickles, onions, parsley and Sufi's sauce with a side of green salad. ender marinated chicken breast cooked over an open flame and wrapped in freshly baked bread with a mixture of diced tomatoes, pickles, onions, parsley and Sufi's sauce with a side of green salad. Skewer of seasoned ground lamb cooked over an open flame and wrapped in freshly baked bread with fresh mint, diced onion, roasted tomatoes and yogurt sauce. Skewer of seasoned ground chicken cooked over an open flame and wrapped in freshly baked bread with a mixture of diced tomatoes, pickles, onions, parsley and Sufi's sauce with a side of green salad. Skewer of seasoned ground beef cooked over an open flame and wrapped in a freshly baked bread with a mixture of diced tomatoes, pickles, onions, parsley and Sufi's sauce with a side of green salad. Patties of ground chick peas, fresh herbs and spices deep fried and wrapped in freshly baked bread with lettuce, tomatoes and tahini sauce with a side of green salad. Grilled and lightly marinated salmon wrapped in freshly baked bread with dill remoulade sauce and seasonal greens. Spicy sautéed eggplant, onions, garlic with chickpeas, tomato sauce and spices served with saffron basmati rice. Sautéed eggplant in tomato sauce with tomatoes, fresh garlic and onions served with saffron basmati rice. Finely chopped and sautéed parsley, scallions, cilantro and fenugreek cooked with stewed beef, dried lime, red beans, served with saffron basmati rice. Chunks of lean beef cooked in tomato sauce, split peas, sautéed eggplant, onions, Sufi's special sauce and served with saffron basmati rice. All kabobs are cooked over an open flame and come with fluffy saffron basmati rice. Skewer of freshly cut Portobello mushrooms, onions, bell pepper, zucchini, squash, and pineapple lightly marinated and mildly cooked over an open flame and served with saffron basmati rice. Two skewers of seasoned ground beef cooked over an open flame and served with saffron basmati rice. Chunks of marinated sirloin cooked over an open flame and served with saffron basmati rice. Marinated and tenderized strips of tenderloin cooked over an open flame and served with saffron basmati rice. Skewer of barg kabob and skewer of koobideh kabob served with saffron basmati rice. Marinated filet mignon and fresh market vegetables, cooked over an open flame and served with saffron basmati rice. Tender marinated chicken breast and fresh market vegetables cooked over an open flame and served with saffron basmati rice. Two skewers of seasoned ground chicken cooked over an open flame and served with saffron basmati rice. Tender marinated chicken breast cooked over an open flame and served with saffron basmati rice. Marinated and tenderized chicken breast cooked over an open flame, served with saffron basmati rice. Skewer of chicken koobideh and skewer of chicken barg served with saffron basmati rice. 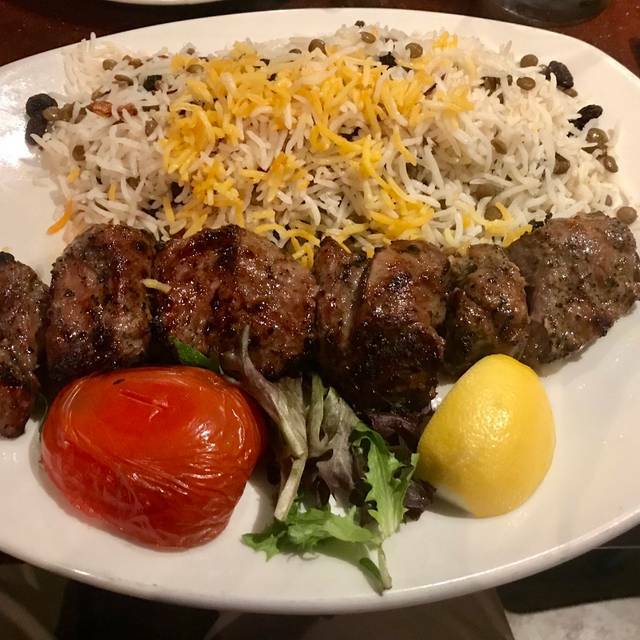 Two skewers of seasoned ground lamb cooked over an open flame and served with saffron basmati rice. Marinated boneless lamb sirloin cooked over an open flame and served with lentil & raisin saffron basmati rice. Grilled and lightly marinated salmon, served with fava bean & dill saffron basmati rice. Marinated jumbo shrimp cooked over an open flame and served with saffron basmati rice. Choice of four kabobs served with any three specialty rice or saffron basmati rice. Saffron basmati rice, mixed with barberries, garnished with almonds and pistachios and served with grilled chicken. Lamb shank slow cooked and served with baghala polo (mixture of basmati rice, dill and fava beans). Basmati rice mixed with lentil, onion and raisin. Basmati rice mixed with dill and fava beans. Basmati rice mixed with black cherry. Basmati rice mixed with pistachio, carrot, sautéed dried orange peel, raisins and almond slices. Basmati rice mixed with barberries, pistachio and almonds. One skewer of seasoned ground beef cooked over an open flame and served with saffron basmati rice. Amazing food and wonderful service! We were visiting the area for business and the wait staff had excellent recommendations. Large portions! More than plenty! Ask for Josh, he is Excellent and has good suggestions if your not sure what to order. good quality, flavorful without being overspiced. The restaurant was clean and neat -- not always the case around Atlanta. Friendly helpful service. One of our better experiences in the Southeast. Sufi’s was a delightfully different dining experience. One we will definitely do again. The service was warm, inviting with the right amount of attention from the wait staff. The food was very good with some exotic twists. 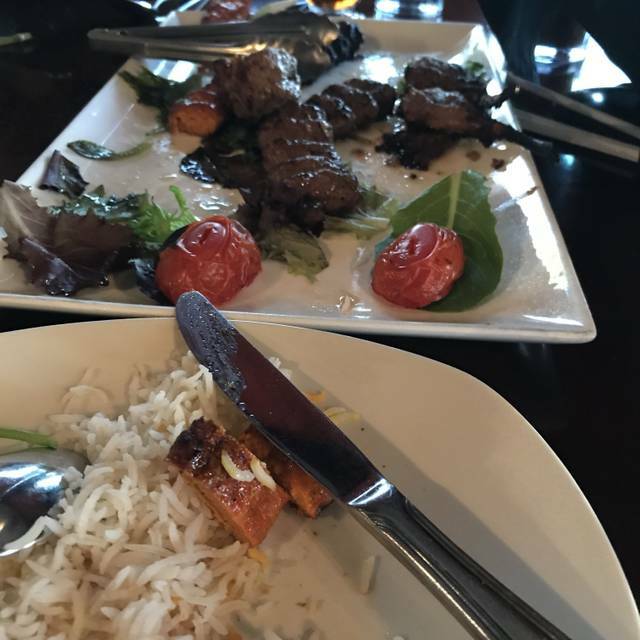 My spouse and I both had the shish kabobs (filet). The meat was very tender and flavorful. The vegetables were flavorful, as well. We had baklava for dessert. 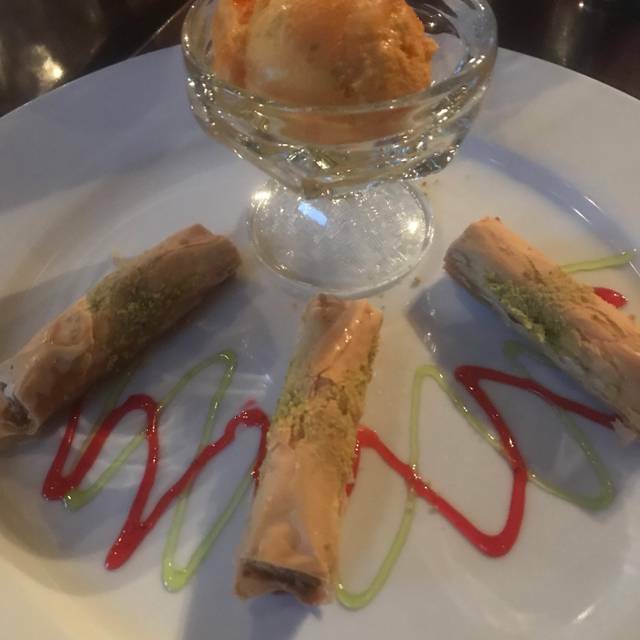 It was different from previous baklava and the best we’ve ever had. During dinner, a musician played an exotic instrument that produced music that I typically associate with the Middle East. We felt like we’d traveled far for dinner. However, we were only a couple of miles from home in Atlanta. Amazing food and service as always! I would just comment that the host (a male) was lacking manners, scowling and very abrupt with guests. Gotta smile at your guests unless you're working behind a takeout counter. He was grabbing stuff off the table, throwing the check down, and rushing around the tables. Why didn't that affect our visit or enjoyment? ... Our server (Skylar), the young lady who bought dessert tray and the manager walking around were lovely!!! Sufi's food was delicious and very vegetarian friendly! The only interesting thing was that my husband and I realized it was VERY quiet in the restaurant - there was no music playing or anything, so until it was a bit later and the restaurant started filling up - we felt like we had to speak softly. The lamb shank is worth a try! Our overall dining experience was great. There appeared to be computer sounds coming through the speakers, but we loved the music and the food as well as learning about some spices and flavors that we're not accustomed to. The food was delicious! Sufi’s has the best Persian food around! They never disappoint! Keep up the good work! Atmosphere and good food sums it up. The dining room was loud and festive. There was a musician playing a middle eastern instrument. Every once and awhile, the host would walk over and clap to the beat of the music. The lamb kabob was seasoned perfectly. The most pleasant surprise was the Adas Polo served with it. Who knew that raisin & lentil saffron basmati rice could be so tasty? Piped music was way too loud but they willingly turned down....was very hot and they adjusted....had open table reservation they could not find but seated us promptly anyway...exellent server, friendly knowledgeable, decor feels tired, decent parsian food intown....easy location and parking for buckhead. Always excellent food and service! Loved the food, staff, and entertainment. A great find and we will be back. My husband and I have enjoyed Sufi's since they opened years ago. We just brought friends there for New Years Eve dinner, and we had an excellent time -- yummy food, nice wine, not too noisy, attentive service. It was very nice and peaceful. Awesome. Food and service were excellent. Only complaint being the American size desserts....individually large enough to feed a family of 4. Didn’t order one due to the size. Top notch Persian food. Good selection. Wasn't too noisy. The food and the service were good. I would eat at this place again. Warm and friendly! Definitely recommend! A group of 8 of us went here on a Sunday night. There were people out on the patio, but not many inside. The waitress was absolutely delightful! So personable and made great recommendations. The food was great. 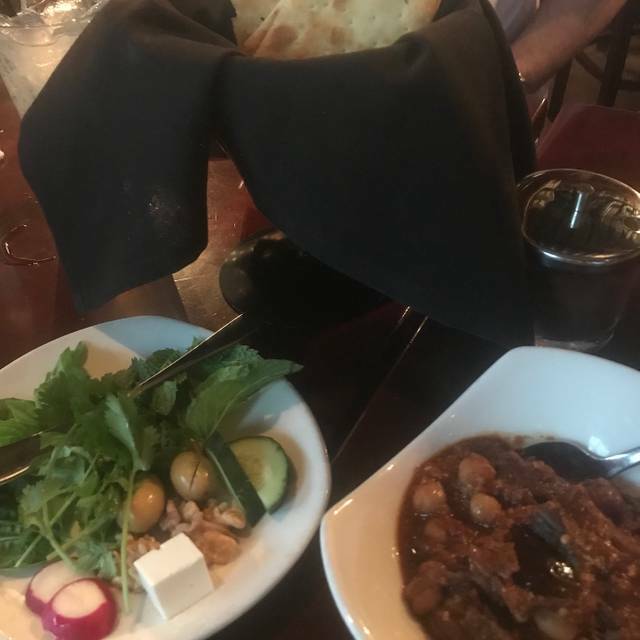 We all really enjoyed it and those that had been to both said it was as good as or better than the other perhaps more well-known Persian restaurant in Atlanta with overall lower prices and a more casual atmosphere. We loved it and would go back and would recommend to others. Always excellent with great attention to detail. Taste is authentic and owner is keen to greet every visitor to a welcoming environment. Great hummus and falafel! Entrees could use more vegetable sides/ small salad on side at that price (rather than so much rice!). Menu can be a bit confusing with little explanation of the differences between dishes. Overall still enjoyable and tasty! even though they were a little short handed that evening with one server out they made the evening work well. The food was better this time than our last visit where the chicken kabobs were under cooked. I would go back for sure. Met my in laws for dinner, their first time. My husband and I love Sufi’s and suggested it. They love it now too! Love this place. Totally legit Mediterranean. Family owned and fantastic. We had a wonderful, delicious meal in an inviting, tasteful setting...thoroughly enjoyable for all! We tried Sufi's for the first time on a late Sunday afternoon after seeing Hamilton at the Fox theater. We parked, walked in, and the place was dead as a door nail and empty. Their were two tables seated and one screaming child whose screams filled the restaurant. We asked not be seated anywhere near that family but the greeter / waiter / bar tender said "We are a small place and there is no where to put you, except outside in the heat". Needless to say, we left and never ate at Sufi's as it was just not welcoming or inviting. Met family there for graduation send off for my Niece, headed on a cruise. Love Suifi’s but wish they didn’t have live music, it’s so loud that you can’t have a conversation without screaming. Music should be back ground only! People don’t go out to eat to hear music, we go out to eat to enjoy the food and company we are spending time with. The service was friendly and attentive. The food was wonderful & the setting was nice. My family and I came in for dinner after graduation last night, we were 30 min late. The server was amazing, she didn’t even complain or rushed us. I forgot her name, but you know who u are, nursing student. My family and I will like to thank you for your hospitality. Great service, lovely outdoor patio, yummy vegetarian options! Every time we are in Atlanta we must eat at Sufi's! The staff are super friendly and the food is amazing! The food is delicious. I would dine here any night of the week for any occasion or for just a nice dinner.